This book is available from CUP and Amazon. Geometric algebra is a powerful mathematical language with applications across a range of subjects in physics and engineering. This book is a complete guide to the current state of the subject with early chapters providing a self-contained introduction to geometric algebra. Topics covered include new techniques for handling rotations in arbitrary dimensions, and the links between rotations, bivectors and the structure of the Lie groups. Following chapters extend the concept of a complex analytic function theory to arbitrary dimensions, with applications in quantum theory and electromagnetism. Later chapters cover advanced topics such as non-Euclidean geometry, quantum entanglement, and gauge theories. Applications such as black holes and cosmic strings are also explored. 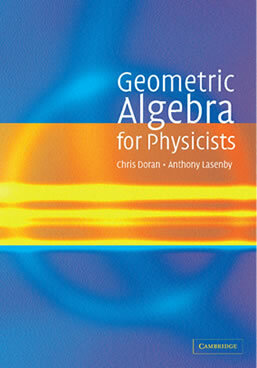 Suitable for researchers working in the fields of relativity and quantum theory, it can also be used as a graduate text for courses on the physical applications of geometric algebra. Nothing in life is perfect, and since the initial release many readers have been kind enough to point out a number of typos and errors. Currently this list refers to the initial hardback run. Many of these were corrected in the paperback edition. I will produce a revised list for the paperback edition. We are working on a set of worked answers to the problems in the book. Hope to have this soon!